The 2015 maple season is drawing to a close. I pulled all the taps a few days ago, and boiled the last of the sap yesterday morning. If I had to characterize this season in one word, it would be COLD. There were several days like the one shown in the picture, where the trees were surely interested in pumping out the sap, but the weather was just too cold to allow any such thing. I spent many days in the boiling shack with my jacket, hat and mittens on trying to stay warm. This is significant, because if you look at the small size of the shack, and the relatively large stove roaring away on a pan full of boiling sugar, you’d think it would be warm in there, insulation or not. But it often wasn’t this year. We had a good week in early March. 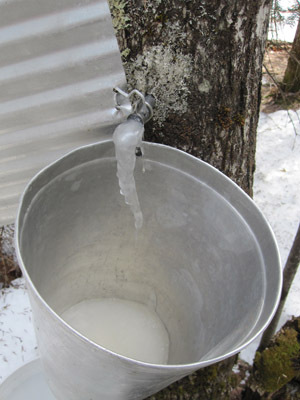 The following week it never got warm enough during the days for the sap to flow, so the buckets hung there with sad little puddles of ice down along their bottoms. After that spell, the weather cooperated, and we had maple weather until just a few days ago when the buds popped. There were a few slow days such that we were able to keep up with the bottling, at least until recently. The rush at the end of the season overwhelmed us, and so today we are hoping to get the rest of the bottling done. I’m trying to do it all on the woodstove, but sometimes I get impatient and get the batch boiling on the electric burner before I transfer the kettle over to the wood range. We find specks of dried sugar in the kitchen for weeks after the season ends, because the syrup splatters sometimes when it is boiling. One pretty neat development in my distribution system evolved from an email I received from my friend Tom the other day. 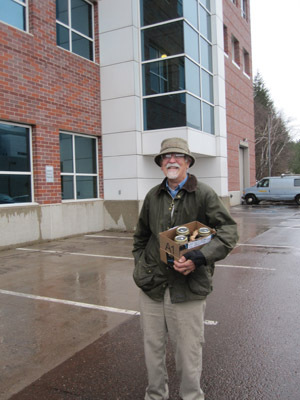 Tom is retiring at the end of this academic year, and is giving himself a present of a hunting trip to Namibia. Part of the package involves him staying in the home of some locals during his time there. Tom wanted to bring them a gift representative of the area where he lives, and asked to buy a quart of syrup from me for that purpose. He wound up buying 3 so he’d have one for home and another for another gift. I asked him to take a picture of his host from Namibia holding the jar, and he said he’d try. So now I can claim to have an international clientele. There have been other good stories flitting through my brain for this past several weeks, but I’m been just too tired to get them written down. Writers walk a fine line… between having enough of the right kind of experiences to generate the stories, but keeping below the exhaustion threshold so the stories can make it online. The maple season is one of the busiest of the year for us, but it generates a good deal of sweet satisfaction. This entry was posted on Wednesday, April 15th, 2015 at 7:11 pm and is filed under Uncategorized. You can follow any responses to this entry through the RSS 2.0 feed. You can leave a response, or trackback from your own site.